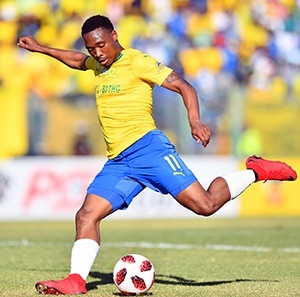 Cape Town - Mamelodi Sundowns forward Themba Zwane believes Sibusiso Vilakazi can have a major impact in the remaining games of 2018/19 after recovering from injury. Vilakazi was injured last year on international duty for Bafana Bafana and was expected to be ruled out for the rest of the season. However, he made a quicker than expected recovery from his Achilles tendon injury and recently made his return in Saturday's 5-0 rout of Al Ahly in a CAF Champions League quarter-final. The return of the attacking midfielder comes at an opportune time as the Brazilians face a number of key games in the Absa Premiership title race and appear to be mounting a serious challenge in terms of the Champions League. Nonetheless, Zwane, who has hit eight goals in all competitions this campaign, takes the view that the availability of Vilakazi comes as a massive boost. He told reporters: "I am happy that Villa is back. Everybody knows whenever Villa is on the pitch what he can do. "You know our combination and understanding can do with Villa and I'm happy that he's back. He is going to bring a great contribution to the team." The Brazilians are next in action on Saturday against the Club of the Century in the second leg of the CCL quarter-final at the Egyptian Army Stadium in Suez. Kick-off is at 18:00 (SA time).